One of our Dayton Diode alumni recently brought to our attention a practical everyday use of 3D printing. Printing keys on a RepRap. We thought this might be a neat way to accomplish one-half of our two-factor access control plan for new members. Lucky for us, we have Fabbr just down the road from us. They are a print-on-demand Makerbot shop (in fact, they may have made the parts in your bot). They specialize in printing RepRap parts, but you can just send them an *.stl and they'll happily print it for you. 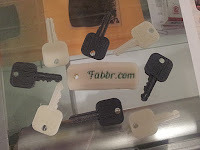 Since none of us were sure if printed keys would actually work, the fine folks at Fabbr printed us up some examples for free. 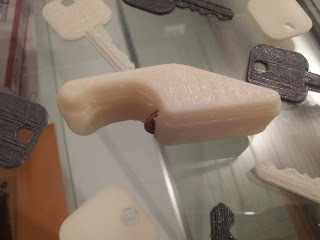 The white keys are ABS and the dark keys are PLA. The example keys were probably a little too thin, so there are still some kinks to work out before Dayton Diode will have rapid-prototyped keys, but they are running a special right now on some pretty neat bottle openers that are known to work in 51 States.